What: Philadelphia-based outfit whose prescription of roots, pysch, folk, and classic rock is the cure for what ails ya. WARNING: If you are actually ill, do not consult a the band for medical advice; consult a licensed physician. And if that licensed physician is a dog, then so much the better. Why: They released their eigth album B-Room at the start of October and seeing as how they love being on the road, they’re now on the road to support it. Who else: The self-described “highly listenable band” from Nashville, Tennessee, Fly Golden Eagle will open up. How: Tickets for the show are $22 in advance but courtesy of Collective Concerts, I’ve got two pairs of passes to give away for the show and as a bonus, one of the winners will receive a copy of B-Room on CD. 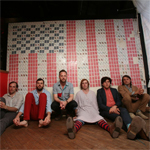 To enter, email me at contests AT chromewaves.net with “I want to see Dr. Dog” in the subject line and your full name in the body, and if you’re interested in winning the CD, say so in the body. It’s 2013, some people aren’t into the physical media anymore, I get that. Contest closes at midnight, November 5. What else: The Broward-Palm Beach New Times, The Courier-Journal, and Pitt News have interviews with the band.